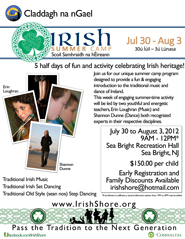 RUMSON – “You want Irish? Rumson’s got Irish. You want green? Rumson’s got green,” said Rumson resident Pete Hogan. Hogan is one of about 16 who have been actively working for about a year to establish a St. Patrick’s Day parade, which is now slated for Sunday, March 10. But before the bagpipers, marching bands, floats and fire trucks take to the River Road route, organizers are still working on raising money and other facets of the celebration. Hogan said he and other members of the parade committee wanted to have more than just a parade, so they have developed a series of events to have a “sense of the green” in the borough. Tim McLoone, will throw the switch, lighting the park’s usual holiday tree that will be decorated with green lights. The lights, which go for $10 a box of 100 lights on a 20-foot strand, is also a fundraiser for the parade organization, Hogan said. The lights can be purchased at Rumson Market, Bain’s Outdoor Living and at the Rumson office of Heritage House Sotheby’s International Realty. Local businesses Atlantic Bagels, Coffee Corral and Cups and Cakes (in Red Bank), have donated refreshments for the night of the tree lighting. A fundraising and thank you party has been slated for Salt Creek Grille, 4 Bingham Ave., on Feb. 26. Tickets are being sold for $50 per person, Hogan said. The parade will start at 1 p.m. in the area of the borough’s Victory Park and continue along River Road to the vicinity of Molly Maguire’s Black Point Inn and Val’s Tavern, toward River Road’s eastern end. There will be grandstands set up along the route and, Hogan said, there are plans to feature “Sandy Heroes” to honor those “who went above and beyond” following the late October storm. Heading the parade will be a “brigade of bulldogs,” with Hogan rounding up owners to get the dogs decked out and ready to spearhead the procession. Organizers initially intended to work with the local schools, the public library and businesses to offer a variety of cultural events, highlighting Ireland’s historical, musical and literary influences. However, “Sandy really put us back,” in addressing fundraising and organizing efforts, he said. One of the events the organizers had to abandon this year but hope to have for the second annual event is what Hogan called the “jewel in the crown,” an Irish Mass at Holy Cross Roman Catholic Church. The plan for it had to be scrapped this year because the Ward Avenue church is undergoing renovations and extensive work. Following Super Storm Sandy there were discussions about canceling the parade this year but organizers thought better of it. “We said in spite of Sandy, this area, these people, need a parade,” and a day of fun, Hogan said.